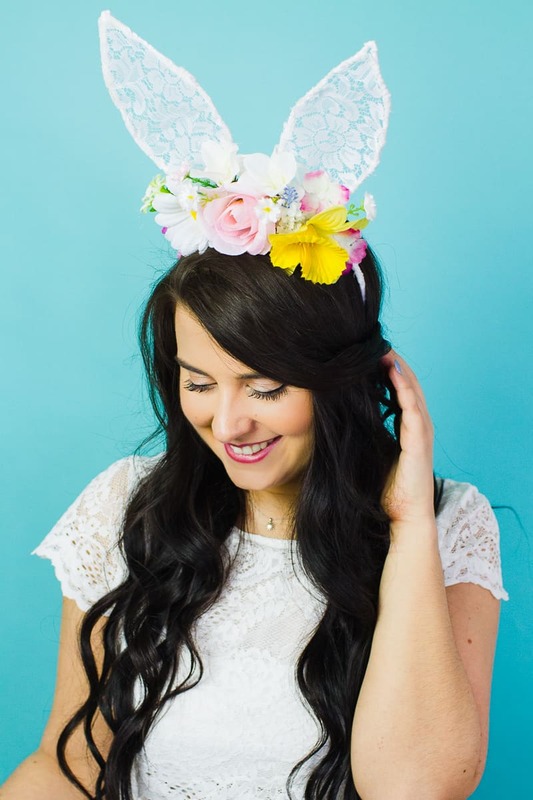 DIY FLORAL BUNNY EARS FOR YOUR MAIDS OR FLOWER GALS! Cut your white fabric into thin strips then wrap around your entire headband, glueing it down as you go. Take your floral wire and form the shape of two bunny ears then twist the ends together at the bottom. Wrap these in your white fabric too using your glue gun. Next take your lace, glue the one side of the wire then lay it on top of one of the pieces of lace. Once the glue has completely dried trim your lace around the shape of your ears. Next we need to glue the ears to the headband, you’ll want to place one ear against the headband leaving the twisted wire hanging underneath, bend that wire around the headband and glue in place. I then covered mine in some more white fabric but this step wasn’t really necessary because the flowers covered it! Allow the glue to fully dry again and then take your faux flowers and start to glue these wherever you would like them along the top of the headband!